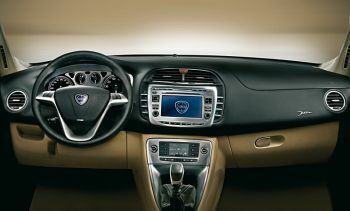 The new Delta, Designed by the Lancia Style Centre, continues the tradition of the great Lancias: the Aprilia, the Appia, the Fulvia, the Beta, the Prisma, the Dedra and lastly the Lybra – and makes a comeback to the medium-sized saloon segment with record-breaking comfort: the exterior dimensions – length of 4.5 metres, width of 1.8 metres and height of 1.5 combined with an impressive wheelbase of 2.7 metres, ensure extraordinary roominess for this category. Lancia dug deep into its reserves of creativity and production know-how to create this unique and exclusive car. The same proud lineage has brought us cars that have written the history of the motor car. Such as the Lambda, the first car in the world with a load-bearing body and independent front suspension. Or the Aprilia that boasted a Cd of 0.47 at the beginning of the 19030s when the average value for cars of the period was 0.60. Or the Aurelia, that concealed beneath its bonnet the first narrow V six cylinder engine ever fitted to a standard production car. Cars that shine because they represent a blend of contemporary technological innovation and the sheer quality of an unmistakably élite lifestyle. And now it is the turn of the Delta to take up the baton and carry forward the qualities of Elegance and Temperament that have been part of the Lancia heritage for more than a century. The Lancia Delta is a superlative exponent of Italian design and stands out amidst the current automotive scenario for the good looks of its exterior shape that is up-to-date, finely wrought and marked by an unmistakeable Italian flavour. The front end of the Lancia Delta is mettlesome and imposing, emphasised by its wing volumes and characterised by an imposing grille, an emblem of the brand. A finely sculpted bonnet and the smooth lines of the wing flow harmoniously to this point while the car’s dynamism is enhanced by a generous lower air intake that speaks volumes about the temperament of the Lancia Delta’s engine. Everything is made even more sporty and high-tech by innovative headlights, veritable gems of design and engineering, adorned by a row of LEDs at the lower profile. The same dynamism is evident at the side, where the main theme is a high waist line and trapezoid-shaped rear pillar providing a natural support for the light-drenched Granluce roof with its clear nautical inspiration. This sun-roof takes up the entire surface of the roof (1.46 square metres) and features a total glass effect that also extends to the fixed finish elements. With its 0,7 m2 of glazed area, the Granluce offers outstanding brightness and sets the Delta at the top of its category for this attribute. 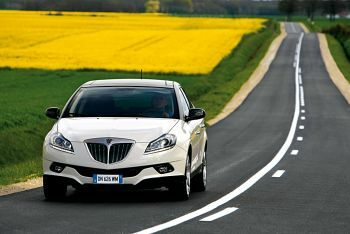 The car’s slender lines are complemented by chrome mouldings that blend ideally into the window seals and emphasise the Granluce sun-roof – and the colour contrast of the lower part of the opaque grey side member that reflects the two-tone colour scheme of the Granluce roof: a clear homage to Lancia tradition The two-tone livery so typical of great Lancia cars of the past now makes a comeback on the latest models through a laborious painting process (taking 6 hours longer than the conventional process): once it was a crafted feature within the reach of a few but now Lancia offers it throughout its range. Apart from anything else, Lancia’s venerable chromosomes seem to make it better equipped than others to meet the needs of customers who know about technology but are also aware of the value of tradition; who demand product substance but also exclusivity and prestige. The generous glazed roof – with its pillars diverging in distinctive manner toward the rear – ends in a spoiler that blends perfectly into the original wraparound rear window that features an up-to-date design without any surround structure. And the same original styling is also evident at the rear, where tall LED tail-lights, an expression of cutting-edge technology, further enhance the Delta's elegant shape. Like the exterior, the interior of the Lancia Delta represent the most advanced expression of Italian style due also to the quality of the materials and the particular attention to detail. The result is a well-lit, welcoming environment that promises unparalleled travelling comfort. As evidenced by the sound-absorbing roof (known as a Noise Absorbing Roof) produced using an innovative polyester-based material that ensures low noise-levels while in motion by reducing interior noise by 2 db. And more: The Lancia Delta offers exceptional levels of light due to the oceans of glass at the sides and, where fitted, a huge Granluce sun-roof that occupies 80% of the total area. 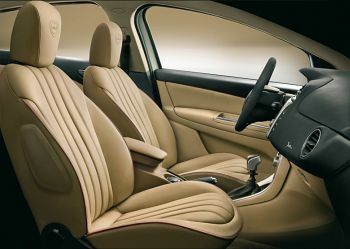 The result is an exclusive, roomy and protective environment: just as you would expect from the interior of a Lancia car. Fully in line with Lancia tradition, the front area is graced by soft surfaces trimmed with top-quality material - from leather to Alcantara® – and a substantial dashboard trimmed with Benova®, a superb and innovative polyurethane product that looks and feels like real leather (the product is registered by Benecke-Kaliko and so far has been used on top of the range models such as Maserati cars). In detail, the Argento specification offers seats trimmed with ‘Carbony 3D’ three-dimensional high-tech cloth combined with Alcantara® inserts that enhance the contrast between top quality and high-tech materials. 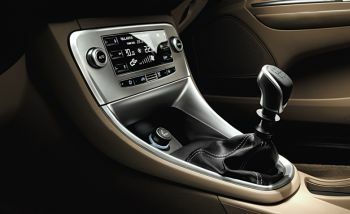 The seat is also complemented by a soft-touch microlux band. The Oro and Platino versions feature an elegant combination of Alcantara® and grosgrain leather on the bands that makes the Lancia Delta even more unique (it is the only car in its category to offer such top quality hide as standard). Leather strips are also stitched into the Alcantara® part to emphasise the car's crafted finish and enhance the design of the seat by making it look more original and exclusive. Lastly, as an option, customers can choose Poltrona Frau® grosgrain leather combined with a very high-tech silver top-stitching that mirrors the ChromeShine finish of the central console, steering wheel and gear knob: this touch of exclusivity combines Lancia class with the sophistication of Poltrona Frau®, one of the most famous Italian designer labels in the world. And there is more: The Lancia Delta is the only car in its segment to offer the top-quality beige Poltrona Frau® option with exclusive maroon contrast piping. Another particularly attractive feature is the central console that seems to float on the underlying surface that some fantastic high-tech plate. This ideal superimposition is further emphasised by an original white light that emerges from the console and illuminates the inventive 3-D look keys. All parts used for driving – console, steering wheel, climate control and infotainment features display the same colour treatment and material use, with a high-tech metallic effect that is evident on the central console (through the use of Chrome Shine paint) and extends to the entire dashboard to emphasise the operational importance of these parts. The unmistakeable Lancia class is also evident in the chrome detailing on the controls: climate control system and radio knobs, door handles and console keys. 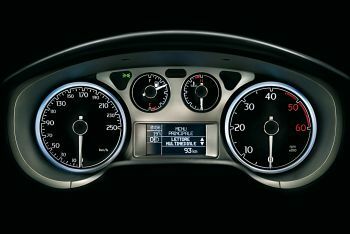 In the same way, the new Delta steering wheel adds a modern twist to the historical four-spoke version while the same formal language is taken up by the stylish gear knob. The seats are enhanced by the presence of the Lancia crest on the head-restraints, hot-stamped with a 3-D silicone injection (as on a Ferrari or Maserati). The Delta is the only car to offer this feature as standard on all specifications to underscore its distinguished nature. Rear seat passengers will also enjoy the greatest comfort and well-being. Partly because the seats, veritable armchairs, ensure outstanding comfort and partly because the rear passenger room offered by the new Lancia range-leader (which boasts a wheelbase of two metres and 70 centimetres) is the best in its segment. The lounge-like feel of the passenger compartment is enhanced by a sliding rear seat with reclining backrest (it can be tilted to 25°) that allows the already spacious boot (380 litres, 465 with the sliding rear seats) to be increased or it can be pushed back and tilted for total relaxation, like a business class seat on an intercontinental flight. It is worth stressing that the Lancia Delta is the only hatchback saloon to offer the option of adjusting the rear seat backrest and sliding the seat. The versatility of the luggage compartment is enhanced by a Magic Back Box, in other words a special surface that allows an ultra-handy absolutely level and continuous load platform to be created by folding the rear seats flat. The system can also always be used as a hidden compartment for fragile or valuable treasures.